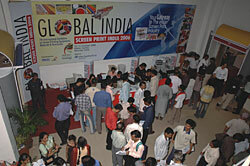 In an endeavour to boost the spirits of exhibition organisers and to pave the path to develop ties for their members in the long run, SGAI supported Screen Print India 2006, which is the leading exhibition on screen printing. The members can look forward to membership benefits while participating in events organised by Aditya Exposition (P) Ltd. This in turn made SGAI wel-known to the Screen Printing Industry globally.